and their vindication from me, declares the Lord. As we each struggle with the thing surround us that happen every day here is a good reminder that God is still at work. A missionary in the New Hebrides Islands described his experience with God's divine angelic protection. Hostile natives surrounded his mission headquarters one night, desiring to kill him and his wife and burn the place down. All through that terror filled night, they prayed that God would deliver them from this evil. When daylight came they were amazed to see the natives leave, looking frustrated. One year later, the chief of that tribe gave his life to the Lord. Remembering what had happened that terrible night, the missionary asked the chief what had kept him and his men from burning down the house that night. The chief replied in surprise, "Well, he said, all those men were there with you! “What do you mean?” asked the missionary, "There were no men there, just my wife and I." The chief argued that the tribe had seen many men standing guard -- hundreds of big men in shining garments with drawn swords in their hands. They seemed to circle the house, so they were afraid to attack. Fear not! You are engraved on the palm of His hand! Thousands may fall at your side but you shall not be harmed. 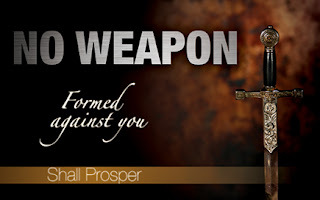 You are loved and cherished, and no weapon formed against you shall prosper! Dear Lord, we thank You for the power of prayer. Help us to pray believing that You will accomplish what You will for us. In the Name of Jesus, Amen.